This stunner by Barry Talis is our collective's Photo of the Month as voted by all Burn My Eye members. I found this scene early on a Saturday morning in the Gothic Quarter of Barcelona, while on my way to meet the participants of one of my workshops. 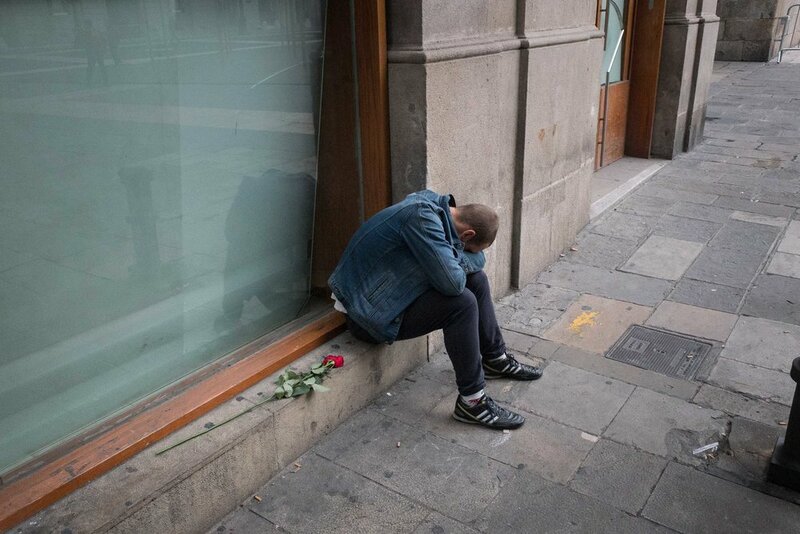 A young man sitting, crying silently, with a red rose by his side. "..For beauty is nothing but the beginning of terror, which we are still just able to endure, and we admire it so because it serenely disdains to annihilate us. ..Shouldn't this most ancient of sufferings finally grow more fruitful for us? Isn't it time that we lovingly freed ourselves from the beloved and, quivering, endured: as the arrow endures the bowstring's tension, so that gathered in the snap of release it can be more than itself. For there is no place where we can remain. ..."
Fragment from 'The Duino Elegies', by Rainer Maria Rilke, 1923.